Demonstrators are generally pens made by Parker for salespeople to use in demonstrating the use and features of their pens. In addition, Parker usually made demonstrators for fillers and other changes they were experimenting with during the life of the Parker “51”. A lot of unusual demonstrators are found in the Parker Archives, but some prototypes made it to the outside, probably with people involved in their development. By definition, demonstrators are not all that common and can command a handsome price premium. 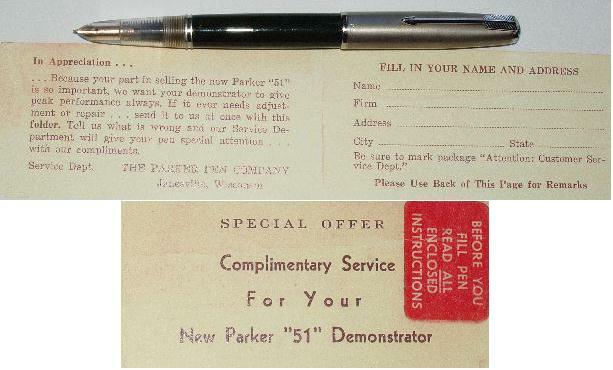 During the Aerometric era of the “51”, Parker made “half-demostrators” available to the public as a marketing ploy. You can read more on Demonstrators in the PenNant Article published Winter 2002, under the “Articles” tab. Ca. 1940. One of the two versions of first Year Demonstrators available. This one has a clear hood and clear double jewel blindcap (this is the only demonstrator with a clear double jewel blindcap). Barrel were of solid colors. The pen has the correct aluminum jewels and is fully imprinted on the blindcap, and has a speedline filler. Wedding band lustraloy cap. Ca. 1941. Second of the two versions of first Year Demonstrators available. This one has a clear hood and solid color double jewel barrel (black is the only color I have seen). Note the unique red plastic collector found on most of these pens. The barrel is hotstamped “Demonstrator”. The pen has the correct aluminum jewels and is fully imprinted on the blindcap, and has a speedline filler. Smooth Sterling Silver cap. Ca. 1942. Starting in 1942, the demonstrators no longer had a tassie and jewel at the end of the barrel. This one has a clear hood, red plastic collector and solid black barrel. The barrel is hot-stamped “Demonstrator”. I have seen this version of the “51” demonstrator with a date code as late as 1945. Ca. 1944. A Parker “51” High Altitude demonstrator. 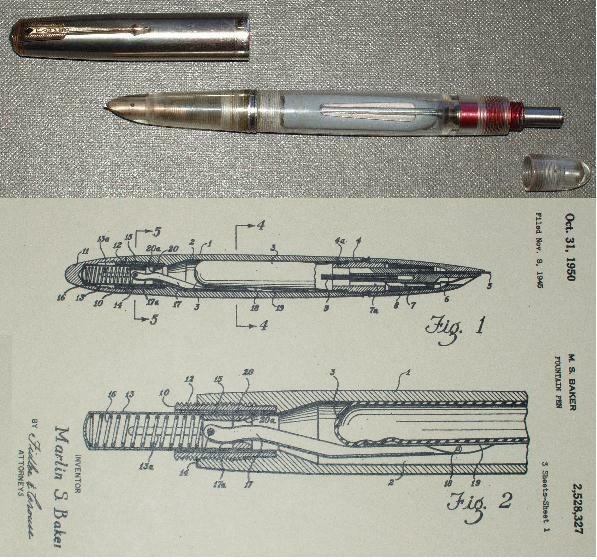 This was an experimental piece by Parker in an attempt to solve the problem of flooding/leaking pens during high altitude flights. Note the long breather tube from the filler to the feed. The cone was used to guide the breather tube into the feed. 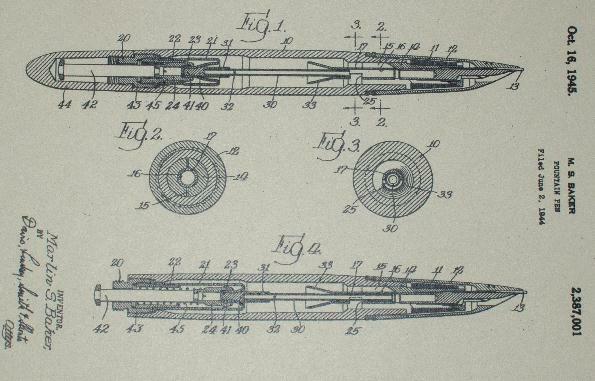 This one is fully documented in the patent above filed by Parker in 1944. Ca. 1946. Parker “51” Red Band full demonstrator. One of the rarest “51” demonstrators. Note the short blindcap, red aluminum threads and the gray sac. The sacs on these pens were not made of rubber, but some other composite material. Ca. 1945. Parker “51” Vacumatic demonstrator with clear barrel and cordovan hood and shell. 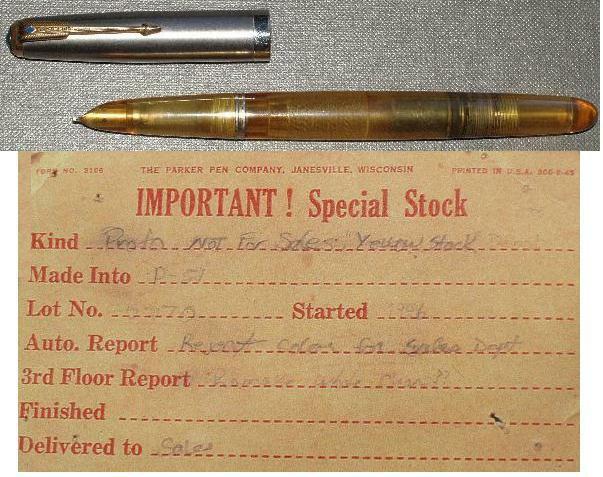 This piece came from Janesville and the interesting part is that it is clearly dated 1945, the earliest date code that has been found on a clear demonstrator barrels. Most clear vacumatic barrels that are found are dated 1947 and 1948, with a few found dated 1946. Ca. 1949. Full clear demonstrator Parker “51” vacumatic filler, Made in England. Pen has full english imprints and unique arrow shape on the clip common to this era pens in England. Vacumatic filler “51” production continued until 1949 in England. Ca. 1948. Parker “51” demonstrator, vacumatic filler. Note the red knob on the filler unit. Ca. 1948. 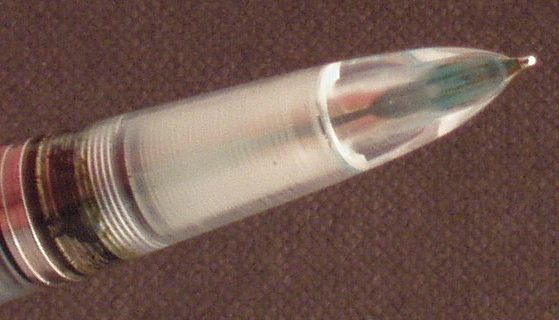 Canadian-made Parker “51” vacumatic fill demonstrator with clear hood and barrel hot-stamped “Demonstrator. Not for Sale”. Full canadian imprints with “8” date code. A full clear version with canadian imprints was also made. Ca. 1953. Parker “51” Aerometric demonstrator and push-type pencil demonstrator. Note that the connector on the pen is also made of clear plastic. This version of the “51” demonstrator has been extensively reproduced in Argentina and can be hard to tell from the originals. Ca. 1958. Parker “51” Capillary Filled prototype. Evidently Parker experimented with a similar filler unit to the Parker “61”. The barrel is machined to fit the filler and the very end (last 1 inch or so) is not bored. The filler sleeve seems to be made of aluminum. Note the breather hole at both the end and the side of the barrel. The feed is completely clear.